Nigeria’s Vice-President Yemi Osinbajo has said the nation is on the path of taking its place among the comity of nations with various developmental programmes ongoing in different sectors of the country. 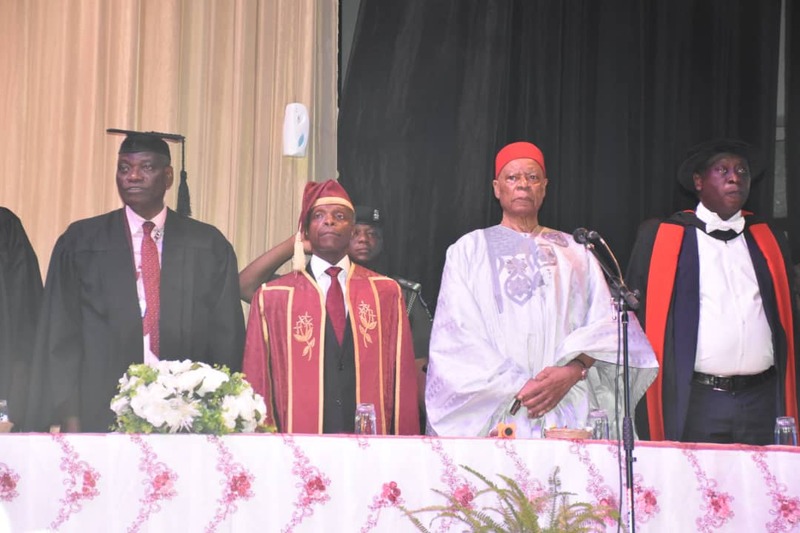 Osinbajo made the assertion at the 2017/2018 50th Convocation Lecture of the University of Lagos on Monday in Lagos. The theme of the lecture is, “Nigeria Rising: The Path to Prosperity’’. According to him, the most crucial pillar of any government’s economic policy should be the improvement of human resource. “I suspect the topic, Nigeria Rising; the Path to Prosperity is informed by the curiosity of what people expect from President Muhammadu Buhari’s administration in the next four years, or what “Next Level’’ really means. “I therefore, think that I should begin by affirming that the Buhari administration believes that Nigeria’s prosperity means a decent existence for all, ending extreme poverty, increasing productivity and ending corruption. He said that wealth creation options should include access to cheap credit, job schemes for the unemployed and cash transfers to the most poor and vulnerable. The administration, he said was working toward providing good healthcare and education that makes our workforce relevant in the knowledge economy. “In plotting the path to prosperity, the Economic Recovery and Growth Plan, we took into account the weaknesses of the Nigerian economy and the illusions that distort our real understanding of our economy. “First is the focus on Gross Domestic Product (GDP) growth figures without the understanding of the underlying dynamics,’’ he said. According to him, a total of 60 per cent of the country’s GDP figures depends on oil. The oil sector itself contributed 10 to 12 per cent, while the rest is contributed by the non-oil sector. Osinbajo said that between 50 and 53 per cent depended on the oil sectors. This, he said meant that the country’s economy rested on a tripod, with two of the three legs depending on highly volatile oil prices and production. “But we have to understand that high oil revenue does not equal better jobs or better human development indices. “For example, the period of astronomical high oil revenues was when we had high level of poverty, infant mortality and unemployment. “Our economy was also being run on a consumption growth model, which is only advantageous if consumption is being met by domestic production of goods and services. “However, our consumption was being met by import, and thus, though the GDP was going up, more people were going into poverty,’’ he said. According to the professor of Law, the only affluent people in the current economic dispensation were the professionals whom, he said, were able to plug into the rent seeking opportunities brought by high oil prices. He noted that the average citizen could not because when the oil prices fall, not only does GDP fall, but the wealth of these affluent people is wiped out. Osinbajo said that the place of corruption was also crucial, adding that the same oil earnings that was supposed to fund education, infrastructure and healthcare ended up in private pockets. He added that the combination of theft of public revenues, the consequent failure to invest in infrastructures and the largely rent seeking business class was what accounted for Nigeria’s current economic situation. “It is important to underscore the fact that our major problem has always been grand corruption, the direct stealing of government resources. “And we must not allow it to happen again because this high level corruption affects the government’s ability to provide the most basic service to our people. “It is clear to us that we need to devise an economic plan which will prioritise the building of infrastructure, fix our healthcare system, ensure food security, provide quality education and create jobs for our teeming youths,’’ he added. He noted that the current administration was on course to providing decent existence for the masses, with a view in improving infrastructure, just like it was also focusing on innovation and technology. According to him, plans were on by the current administration to completely democratise access to innovation. He noted that it was important too that government would be able to put in place, an educational system that would take care of practically every one. Osinbajo added: “Our home grown feeding programme for instance, feeds about 9.2 million children in 26 states across the country with plans underway to cover the remaining 10 states soon. “Today, we have all sorts of figures where our out-of-school children is in the range of 10 million and all of that. We understand the problem and when we talk about these children, we are talking about the primary school children and this is run by the states and the local governments..
“Now, there is no way that the Federal Government will on its own pick up this responsibility solely because each of these states run its own private school system. “If we look at the figure, you will find disparity between out-of-school children in Lagos and that of Bauchi or Anambra,’’ he said. According to him, what government was trying to do at the National Economic Council is to look at the challenges at the various states and proffer solutions. He added that what this meant was that government would have to compel all the states of the federation to provide more resources for education as well as healthcare. “So, we have to ensure that the states provide more resources and we will back the states as much as we can with resources for education and healthcare. “What I see is that in the next few years, we will resolve the issues we are having with our out-of-school children. “Another of my greatest worry is respect to quality of education which, of course, brings me to the question of teacher training and how to get the best from our teachers. “That is why we are currently looking at how to revamping teachers training. How do we ensure that our teachers are not just better trained in a particular way that is relevant, especially their digital requisite skills and those skills that are relevant for their immediate future,’’ he said. Earlier, the Vice-Chancellor of the university, Prof. Oluwatoyin Ogundipe, noted that the jubilee convocation would be well celebrated as the institution had recorded giant strides in the area of entrepreneurship, research and innovation. Ogundipe assured Nigerians that before the end of the year, the institution would record an improved ranking. The Standards Organization of Nigeria (SON) warns importers on consequences of the patronage of fairly used cooking gas cylinders.